The multi-parameter CyberScan PC 510 microprocessor-based bench meter incorporates many advanced features to meet today's requirements. Push-button calibration ensures simple operation while configurations can be customised through its SETUP function. Meter comes with epoxy-body pH double junction electrode and conductivity electrode with a built-in temperature sensor, complete with an integral electrode arm. The CyberScan CON 510 Conductivity and Total Dissolved Solids (TDS) meter is equipped with new generation Application Specific Integrated Circuit (ASIC) that provides ample sophistication with advanced features, while maintaining a user-friendly interface. The meter allows single or multi-point calibration (up to 4 points) in the automatic mode that provides quick, effortless calibration. In addition, manual calibration (up to 5 points) allows non-standards solutions to conform to individual’s requirements for best meter accuracy. The meter automatically detects and displays the appropriate measurement range thus eliminating guesswork. Up to 50 sets of Conductivity or TDS readings with temperature values (oC/oF) can be stored and recalled from the meter’s non-volatile memory for report generation. Appropriate Temperature Coefficient and the correct cell constant can be set for accurate and precise measurements. 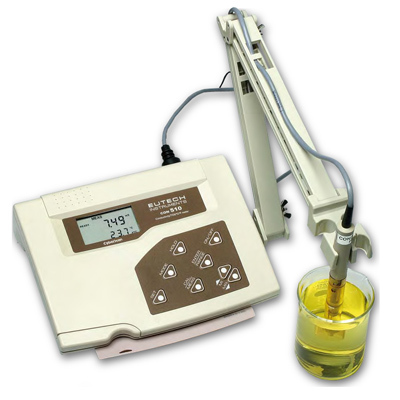 Stabilised measured readings are automatically held when Auto-hold function is activated. Ready function informs user when readings stabilise for easy reading and data-log into memory. Built-in Automatic Temperature Compensation (ATC) ensures reliable readings under fluctuating temperature conditions. The large custom LCD (Liquid Crystal Display) provides optimum viewing of measured values with units of measure. Graphical icons and self-diagnostic message codes provide user with comprehensive information for trouble-free operation. A handy slide-out instruction card serves as a reference guide for keypad functions and troubleshooting. Keypad is splash-proof to protect the meter from accidental spills. Tactile feedback during operation confirms key selection. Non-skid pads immobilise meter during operation. Integral electrode holder saves space by neatly accommodating electrodes for hands-free operation. The conductivity electrode has a built-in temperature sensor and is specially designed to minimise bubble entrapment during measurement. Minimum electrode maintenance is required and the sensor materials used have good chemical durability.